China continues its poor treatment of its political prisoners as a Taiwan-Chinese activist, Lee Ming-chech was arrested while visiting. Ever since his wife has had to overcome many obstacles in order to attend her husband’s trial and visit him. These include having her travel permit to mainland China suspended while still in the country, and denial of correspondence rights between her and her husband. The treatment points towards a general trend of political pressure exercised by the Chinese government on political activists, using people like Lee as deterrents. The wife of a Taiwanese democracy activist jailed in China said Wednesday he is denied “basic correspondence rights” after visiting him in prison for the first time in a case that has strained cross-strait relations. NGO worker Lee Ming-cheh was sentenced to five years in prison in November on charges of subverting state power by a court in central Hunan province, as activists face increased pressure from authorities under Chinese President Xi Jinping. Lee was arrested in March 2017 during a trip to the mainland and held incommunicado for months. Taipei has called his jailing “unacceptable” and a serious blow to relations with Beijing, while his wife Lee Ching-yu has said his trial was a “political show”. Lee Ching-yu was allowed to visit her husband in Chishan prison in Hunan on Tuesday, when they spoke for 30 minutes through a glass window. “Lee Ming-cheh’s health… in prison seems fine from his appearance… But it’s very obvious he is still denied right of speech and basic correspondence rights,” she told reporters at the airport near Taipei after returning from China. “He still cannot write letters to me. Even though the reason he gave is that he has very busy work hours in prison,” she said, adding that Lee only received two of the 11 books she sent him. Chinese authorities cancelled Lee Ching-yu’s mainland travel permit last April as she searched for her missing husband and later only granted her single-entry visas to attend the trial and sentencing. In January, she was barred from boarding a flight to visit Lee in prison. Lee Ming-cheh speaks with Lee Ching-yu. File photo: Screenshot/Yueyang Intermediate People’s Court. “Lee Ming-cheh cannot correspond with the outside world and his family’s visitation rights are not ensured. This is evidence that China violates international and even its own laws,” said the association. 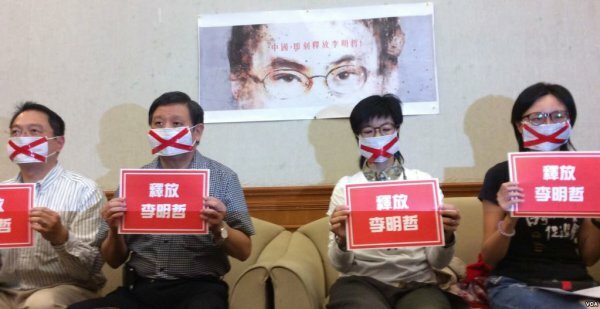 Amnesty International and other Taiwanese rights groups have also called for Lee’s release.